Well it seems like we are making up for the dry March weather in April! It was a wet week and looks like we have a bit more rain in store for the weekend. On the freshwater front, all of the rain brought river levels up and coloured the water a bit as well. Fishing has been consistent and the key to success is to cover water be prepared with a well-stocked tackle box to ensure you are ready whatever water conditions you may encounter. As we are heading into spring, we are thinking local lake fishing. Don’t miss out on Aidan’s review on local stocked lakes. There has been lots of action on the saltwater front. This past week there was good to excellent fishing at pretty much every major springtime spot. So that includes the Bell Buoy, QA Marker, Hump, and South Bowen. When it comes to fisheries announcements there is still no news yet. We were expecting it this week, but nobody really knows, so for now it is business as usual. If you’re looking to stay dry but get your “fishing fix” grab a seat in one of upcoming courses. Trevor is back next week teaching his Introduction to Chironomid Techniques Class and Matt will be back in the classroom once he is back from CXI to teach our Introduction to Fly Fishing Course and Introduction to Fly Fishing Lakes! Call the shop at 604.872.2204 to sign up today. April is in full swing and we have got a great line up of courses for those of you looking to get dialed in for the upcoming freshwater season. The season is nearing its end. The river is out of its clear water funk, rising to about 1.8m on the graph and has gotten dirtier. These conditions are good as a little bit of colour will give these fish much needed cover and the higher water levels will give them more room to spread out. While it may not be as simple as just finding the deepest hole and knowing you are fishing over a school of fish now, this extra water will bring in newer fish and get them into a more aggressive mood. Focus on your bigger presentations to provoke a reactionary response. With the warmer water this means fishing pink worms, colorado blades, and swinging spoons for the gear guys. Big and bright streamers are what the fly guys will want to swing, especially down in the lower river to intercept the last few fresh schools coming in for this month. We have a couple of more weeks before the river becomes fly fishing only from the Vedder Crossing Bridge and closed above. Get out there for one last shot if you want to get some steelheading in before freshet sets in. It is almost over so now is the time. The Squamish will be interesting this weekend. It looks like there is going to be rain for most of the weekend, but it doesn’t look like there will be enough to blow the river out. It did blow out earlier in the week, but it has started to settle and it should be fishable for the weekend. The upper river has been fairly clear while other portions further down have been pretty coloured at times. It will be a good idea to bring a mixed bag of gear to cover all the water conditions that you might encounter throughout the day. 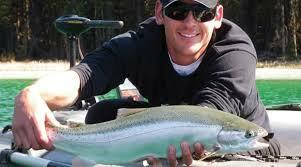 If you are fishing gear for steelhead; worms, jigs, blades and spoons are all producing fish. 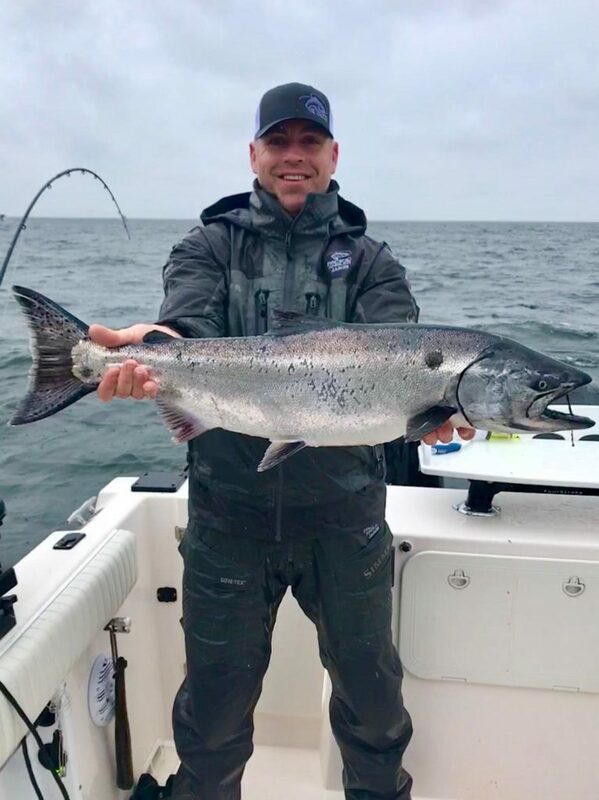 For the fly anglers, bring a variety or weighted and unweighted flies in small and larger sizes for steelhead so that you can fish in any water conditions as it can be clear early on and colour up later in the day. We still have some of Andre’s fry patterns in the shop so if you are hunting for sea-run cutthroat or Dolly Varden these are a must have! Steelhead fishing on this system is pretty tough, so it is a good idea to be ready to pounce on some trout when you see them crushing fry on the surface. It can be a nice break from the sometimes tiresome steelhead search. 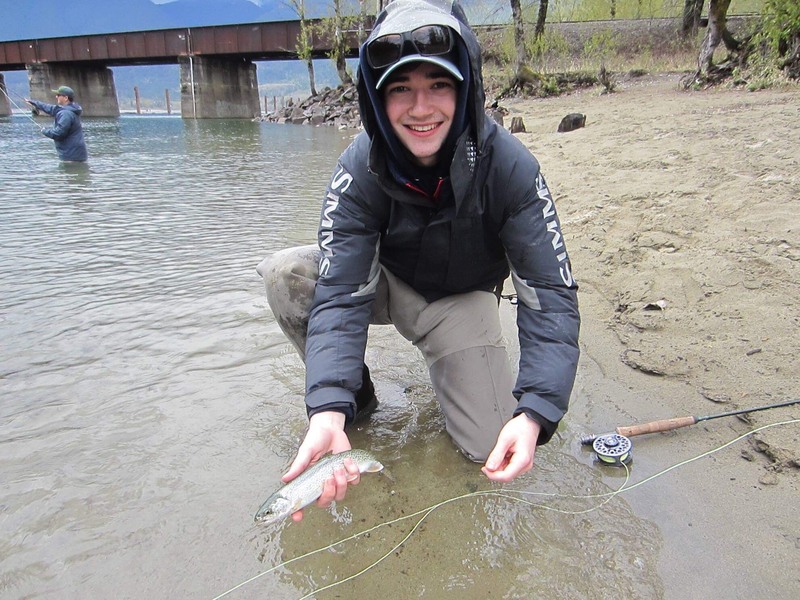 If you are looking to get an early stillwater fishing day in, Squamish can be a great little day trip. There are a number of stocked lakes in this region and it doesn’t look like these lakes have been stocked yet, but that should change very soon. I have fished a few of these lakes early in the season before and have had some great days. The Pemberton and Whistler area lakes still have some ice on them and should change in the near future. The water level of the Harrison is coming up. In the last few weeks the Harrison had been at near record lows. With the rain and snow melt it has bumped up to a high but still very fishable level. Though we battled through wind and rain on Saturday we still managed to find feeding cutthroat. Persistence and patience were key. There were good numbers of fry in the system. Most of the fry I saw had light brown backs. However, it is important to ensure you have a good selection of colours to ensure you have what the picky cutthroat want. Springtime is here, and with it, comes local lake fishing! I’ve been scanning www.gofishbc.com to see which lakes have been getting stocked for the past week or so, and there are some great options for you! As a side note the Go Fish BC website is an excellent resource for stocking reports, updated regulations and local fishing events. On the fishing end of things let’s start off with Buntzen, which has been stocked with over 3500 spring catchable rainbows, not to mention the 2700 that were stocked in October of last year. 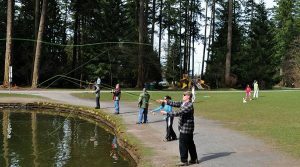 Buntzen is a great lake to spend a day at, with plenty of accessible options from shore. If you’re more inclined with smaller water, Sasamat is another great option. It was stocked with 2750 spring catchables, and the previous year’s 1100 fall catchables. Both of these lakes have been producing double digit days for all sorts of anglers, from fly fisherman stripping leeches, to the gear guys wailing on the rainbows with an assortment of trout spoons and bait. Let’s carry on to the more urban lakes we have at our disposal. Como, Deer, Lafarge and Green Timbers have all seen stocks replenished with 2000, 1600, 2500, and 2500 fish respectively. All of these are excellent options for all of you who would like to stay close to home, and still have an awesome day on the water or if you only have a ½ day to get out there. As the weather continues to warm, we’ll be seeing more ice offs on the more remote lakes, such as Weaver, Grace, and all of your favourite Squamish ponds. 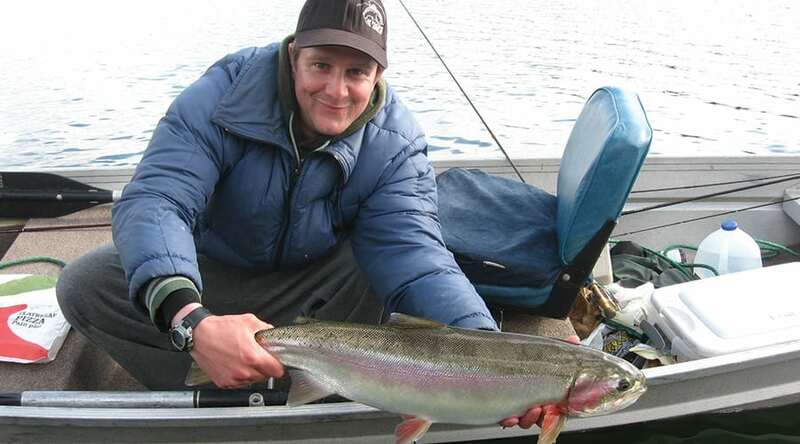 More ice offs means more stocked rainbows for us! So everyone get out your favourite ultralight spinning rods or classic 9ft 5wt action on your fly rod and get to these local lakes! 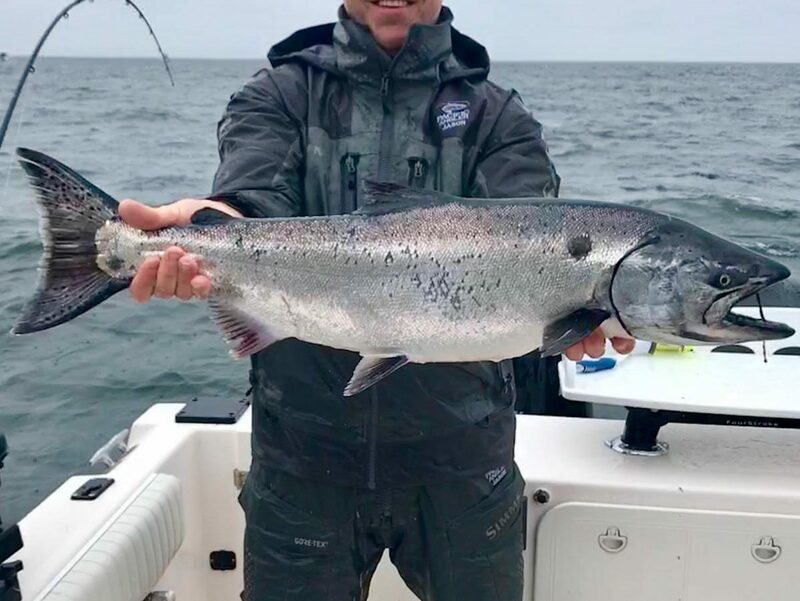 Well it’s official, the wave of springtime chinook showed up in full force this week, and right on schedule! As usual, we are seeing a mix of whites, reds, hatchery, and wild fish. It’s nice to see some of the larger whites showing up as well, into the low to mid teens. There are always a few 20 pound plus fish taken in the next 3-4 weeks and even the odd Tyee. So time to take off those old leaders that have been sufficient for the 6-10 pound winter chinook and get some fresh gear on! This past week there was good to excellent fishing at pretty much every major springtime spot. So that includes the Bell Buoy, QA Marker, Hump, and South Bowen. Sunday and Monday were really on fire and things slowed down a bit mid week with the low-pressure system, but it was still pretty good out there. There is no “one spot” this time of year as these packs of hungry chinook are cruising around looking for bait and are really on the move. One day the hot spot is Cowan, the next day it is the QA, the next day Roger Curtis, etc. I usually give a spot a few hours and if I haven’t hooked any fish or seen any bait or fish on the sonar, time to make a move. Hot depths have been in the 90-120 range. Productive flashers have been bright, so think chartreuse and green. The Salty Dawg, Lemon Lime, BC, STS were all very good this week, as was the Phantom in chartreuse. Spoons, bait and hootchies have all been very good. 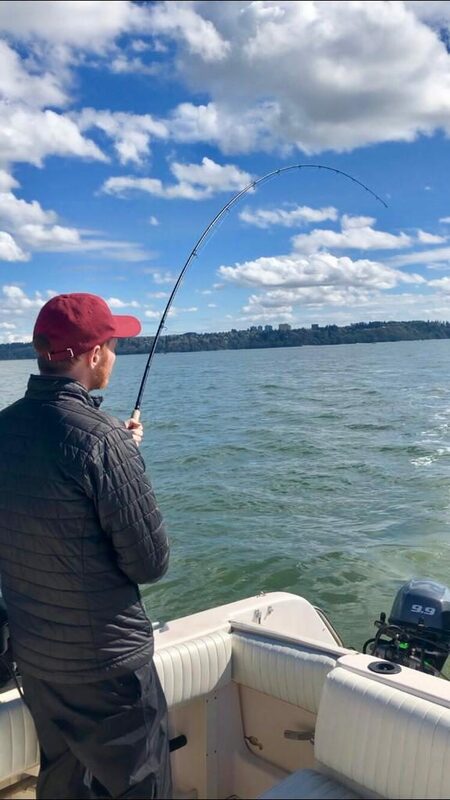 I would give bait the edge for bigger fish this past week, but there are so many small fish around it can be better to fish artificial so you can get your gear back in the water quickly. Top teaser heads have been glow chartreuse and glow green versions in Rhys Davis Anchovy Classic with a 5.5 anchovy or Rhys Davis Bullet Roll with a red size (small) or green size (small/medium) size herring. G-Force and Skinny G spoons have been hot. For G-Force the 3.0 and 3.5 size is working well in colours that have glow and green on them like BC, Trailhead, Outfitter, and No Bananas. The same colours in the Skinny G have been very good as well. Yamashita hootchies in regular size or cuttle fish size in chartreuse and green with splatter back have been good with about a 32-inch leader. As noted before, the fishing was pretty awesome this past week, so get the tarp off your boat and get out there, it’s time! So I know what your next question is. When it comes to fisheries announcements, your guess is as good as mine at this point. All I know is they are working on something and there will be some sort of announcement. We were expecting it this week, but nobody really knows, so for now it is business as usual. Here is a letter from the SFI that is worth a read Seeking Balance . The SFI has been hard at work, fighting for our access to sustainable chinook stocks and putting a lot of pressure on this government to follow the science and not the politics. If you want to help out, join and donate to the SFI. They are very active in behind the scenes and all anglers owe them at the very least a membership and a donation in my humble opinion.